Our third and final district was in Windsor. The Bees were BUZZing with excitement to travel BEE-yond international borders for the first time since 2004. We were able to collaborate with teams that we usually do not get to work with. 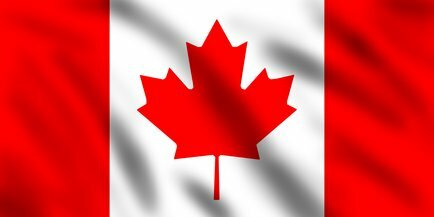 It was great to BEE in Canada and have our team sing the American national anthem at the BEEgining of both days. The first day in Windsor was unBEElievable. Our auton was greatly improved thanks to the countless hours from our drive team. Our record was 3-4-1 and we were ranked 15th. 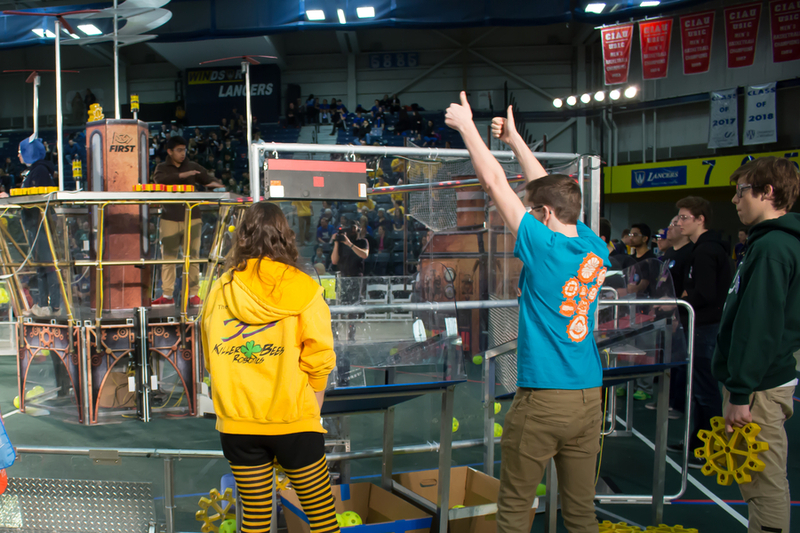 We continued our great success on the second day and, we were ranked 3rd and had a record of 7-4-1 going into alliance selection. 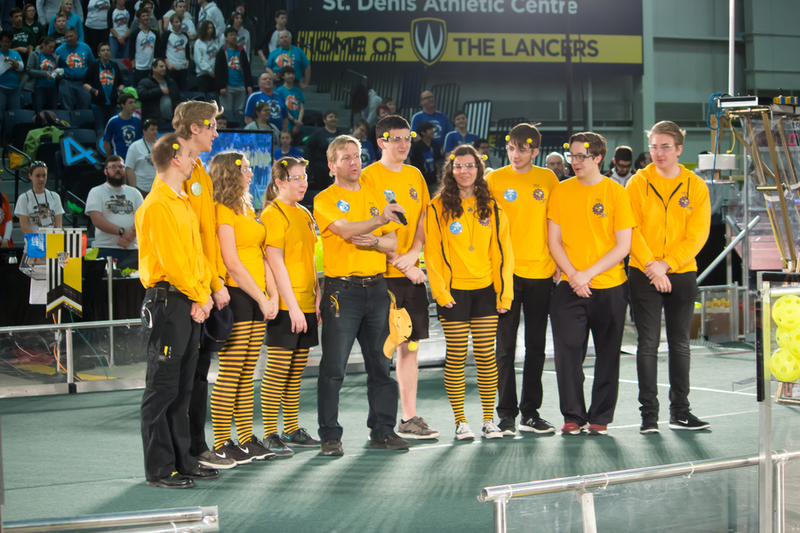 We were happy to BEE part of the number 1 alliance with 772 as alliance captain and rookie team 6331. We performed unBEElievably well in the playoffs even though we had issues. During semifinals match 2 our robot broke down and as a result, there was a field fault. Our RIO was shorted out, and we were unable to compete in Semifinal match two and lost. Luckily we have an amazing pit crew that did not give up and was able to get our RIO replaced by the BEEginning of semifinal match 3. We won the third semifinal match and were finalists. We also won the Creativity Award sponsored by Xerox. We did amazing at Windsor thanks to teams 772 and 6331, and we would also like to thank the University of Windsor for having us. Summer has started and we are already planning next year! Experienced students are working on new projects and learning new skills over the summer. 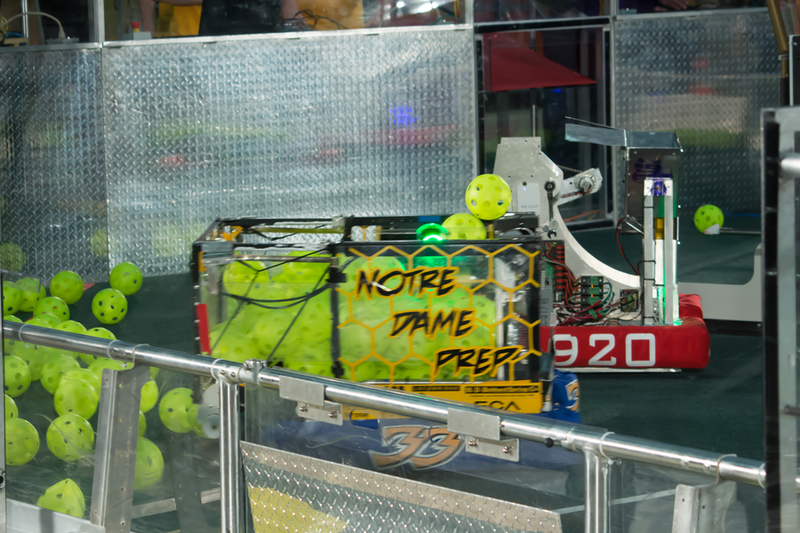 Recruitment for the 2018-19 FRC team with Notre Dame Preparatory, Pontiac, Michigan students begins in late August. You give the best parties!